Big rig trucks are not the only dangerous trucks on the roads and highways in the Augusta area. Delivery trucks, such as FedEx, UPS, and store delivery trucks, can be the cause of truck accidents that result in victims suffering devastating injuries or death. Unlike big rig truck wrecks, delivery truck accidents can happen in neighborhoods where adults, teens, and young children are often on the road walking, biking, and skateboarding. If you or a family member was the victim of a delivery truck accident, you may be able to hold the negligent truck driver—as well as other parties—liable for compensating you for your injuries. Inexperience. Like a larger semi, a delivery truck requires a certain level of driving experience and training before a trucker can safely drive it. When an inexperienced and untrained driver is sent out on deliveries, he is more likely to cause a wreck because of his inability to spot dangers and to know how to respond to them. Improperly loaded cargo. When the goods being delivered are not properly secured or loaded, this can cause the cargo to shift, making the truck less stable and difficult to control. In addition, unsecured boxes or other items could fall off the truck, resulting in motorists, pedestrians, and bicyclists getting into accidents while trying to avoid the obstacles. Distracted driving. A delivery truck driver who is distracted by eating and drinking, texting, or talking on a cellphone can fail to see hazards on the road. A distracted driving accident can be even more tragic if it occurs in a neighborhood and the victim is a child the driver did not see. Lack of maintenance. If the delivery truck is not properly maintained and repaired by the trucking company, this can be the cause of a crash. Brake failures and tire blowouts are common maintenance problems that cause deadly collisions. In some cases, the problem could be that the repair facility failed to properly make a repair or a truck part could be defective, which could mean additional liable parties responsible for compensating you. Sudden stops. Delivery truck drivers searching for the next location to make a delivery often make sudden stops without warning. In this situation, the negligent trucker and not the driver in the rear may be the cause of a rear-end collision. Sudden left turns. Like sudden stops, a delivery trucker can make a sudden left turn rather than properly turning around in the rush to make his deliveries more quickly. Failing to engage brake. Some delivery truck accidents occur when the trucker forgets to engage the parking brake, and the truck rolls backward while he is outside the truck making a delivery. Backing up. A delivery truck has a blind spot directly behind it where the driver cannot see vehicles, bikers, or pedestrians. A devastating backup accident can occur if the driver backs up to stop at an address and hits a bicycle rider, child, or person walking on the road. 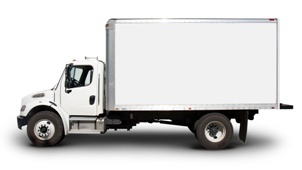 Who Could Be Liable Parties in a Delivery Truck Accident? Delivery truck accident claims can be complicated and involve violations of federal regulations governing these trucking companies and truckers. Let the experienced truck accident attorneys at Chris Hudson & Associates investigate your wreck and negotiate your settlement for you. To get started contact us online or call us directly at 888.795.6261 to schedule your free consultation.